From our beach, just as the sun goes down and is almost disappearing into the water, a brief very bright flash of red light shoots out of the ocean. It is almost startling. While the phenomenon is well known it is something you must see to believe. Although our cottage is a short walk to the beach and it is well worth the effort. Red Sky Cottage has been outfitted to make your vacation dreams come true. Bring your family and friends, like we do to rest, relax and have fun together. You will want to sit on our nice deck and relax. Sit in the bubbling Hot Tub. There is a good quality barbecue and clean ocean air. In summer, most visitors spend every night at our fire pit toasting marshmellows and telling stories. In spring and autumn, people flock to our beach to dig world famous razor clams. There may be no more delicious food in the entire world. The kitchen inside has a full range and oven, refrigerator freezer, microwave and all the pots and pans you need to whip up dinner for the family. There are plenty of dishes and silverware plus an efficient quiet dishwasher. We have three nice bedrooms each with a Queen Sized beds you can stretch out in, and two handy bathrooms. You'll find the entire home clean, neat and tidy. 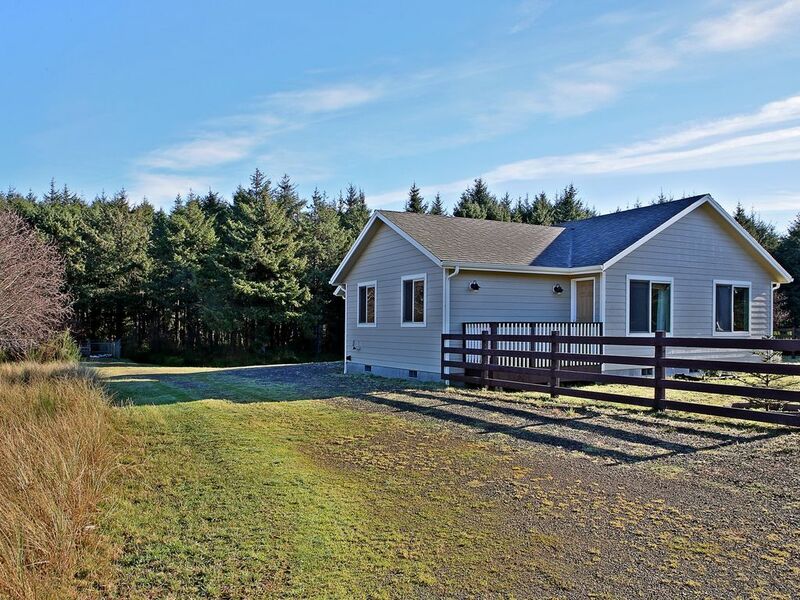 At night you can, of course, watch some television on our new flat panel TV or stretch out read a book, play games and rest aided by the quiet of the country side, but you'll be able to hear the ocean just a walk away. But again the next morning the sun will alert you that its time again to walk to the beach, watch the waves and wait for that red sky all over again. This place was amazing. Well maintained and just what we hoped for. We all had an amazing time and plan on coming back next year. Clean and completely as described. I would stay again and recommend it to my friends . Thank you for allowing my family to stay at your property!!! It was set up perfectly and had everything we needed. The instructions had everything we needed to know about our stay as well, which was amazing!!!! We had a mother deer and two babies resting and eating on the property 80% of the time, it deff kept the kids happy! Thank you again so much!! Thank you so much for letting us stay, we had a blast. We can't wait to come back! Wonderful location. Had a weekend of family time and the cottage met our needs. The house was perfect! Plenty of room for all 6 of us. The beds were quite comfortable as I am super picky in that area. The hardwood floors are beautiful! The hot tub was a nice feature as well. I love that even though there was a neighbor, we still felt secluded. The fire pit was a nice feature as well. The beach was close too. We spent time there, it was wonderful. On our last night there, we made it a point to watch the sun set and had literally a two minute drive back to the house. We are already making plans to come back next year, we enjoyed the house and stay so much! We had a wonderful unforgettable stay here with our four daughters ages 5, 3, 2 and 3 weeks old. It was the perfect location! Close(just one block) from the ocean which you can hear at night by the way but yet the road is so quiet, no traffic or cars at all. We felt like we were in our own little world! The house was immaculately clean and accommodating to all our needs. We can't wait to go back!